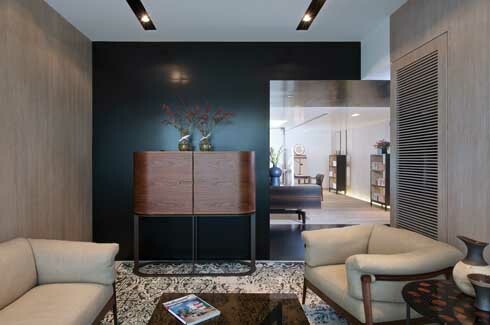 Rajiv Saini & Associates compel Atelier Giorgetti’s first space in Mumbai to shed its garb of a showroom and don that of a home. The white sheets on the plush mattress invite you to rest a minute away from your busy schedule. But a minute is not enough. You curl your legs up on the bed and think, ‘One more minute won’t hurt.’ The next thing you hear is a subtle clearing of the throat. You wink one eye open at the polite, smiling face peering at you. 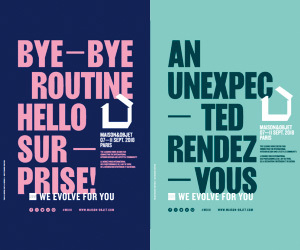 “Yes, home-like” is your sheepish reply as you step off with as much poise as you can muster. 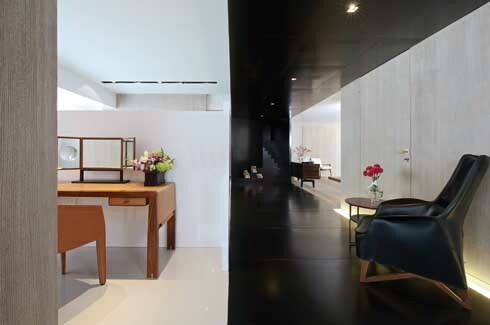 When Rajiv Saini & Associates were approached by Atelier Giorgetti to design their first showroom in Mumbai, they knew they did not want it to look like just any other furniture showroom. 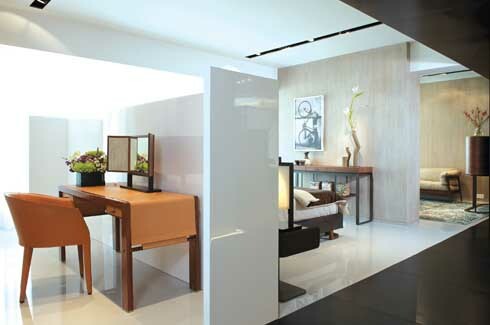 The client brief was open – a space to showcase their furniture. 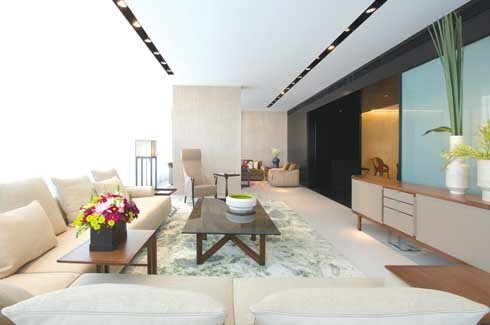 The 4000 square feet space acquired by Giorgetti was on the tenth and eleventh floors of a new residential development and also included the 12th floor terrace space. The location prompted the design team at Rajiv Saini & Associates to style the project as an apartment house rather than a showroom. 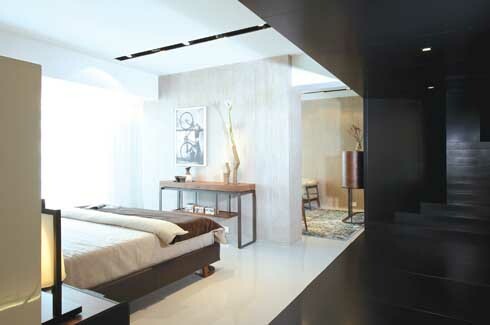 Rajiv says, “The idea was to retain the feel of a home. We did not want it to be a typical showroom with six sofas lined up, followed by six beds and so on.” The partition walls of the original apartments were gutted and a more open plan was incorporated to give the visitor an impression of meandering through a private home. The first level of the house has been dedicated to the bedroom suites. A large four poster bed with a contemporary twist takes centre-stage in one bedroom. Side tables, armchairs and other pieces of furniture in complementary shades of wood accessorise the room and complete it. The other bedroom is marginally smaller. Concealed spotlights help maintain the home-like atmosphere while directing a flow of light on desired spaces. The upper level has been divided to display different seating arrangements and a dining area. 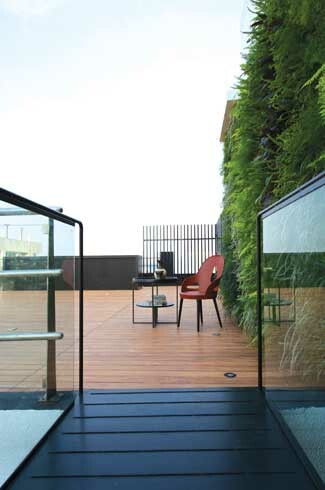 The terrace displays Giorgetti’s comprehensive range of outdoor furniture. And, with the expansive views of the city on offer, it also doubles up as an ideal venue to host events and introduce new collections at same time. A meeting room has also been incorporated to provide a meeting space with architects. 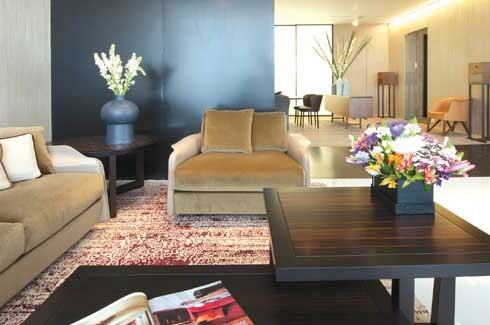 An ornate carpet sets off the contemporary furniture. In its 112 year old existence Giorgetti furniture has become associated with the highest degree of craftsmanship in leather and timber. The design team wanted to juxtapose these materials against a more modern palette of materials. Limed oak, blackened metal and resin have been used across the apartment. The design team also did not have to be concerned with practical issues, like storage, generally involved in the planning of a house. “In that sense it was a more fun, and easy project,” says Rajiv. White lacquered screens have been used to separate the different areas. WANT TO VISIT YOUR SHOWROOM. Nice post for the people looking good design in furniture.